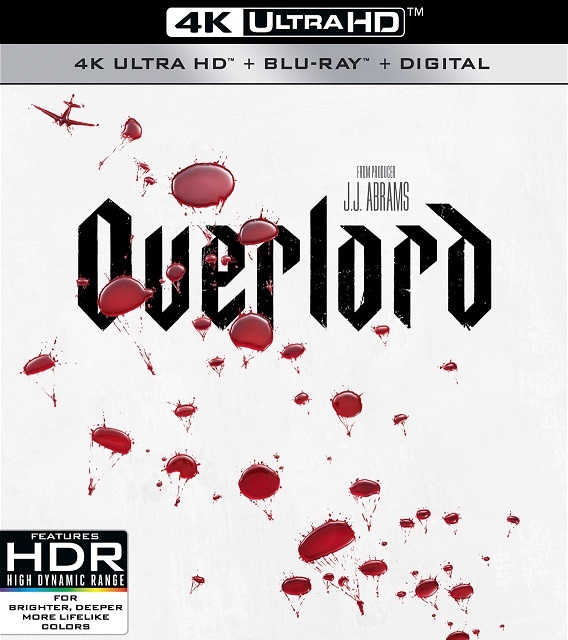 Produced by J.J. Abrams and directed by Julius Avery, Overlord is now available on 4K UHD, Blu-ray Combo Pack and Digital. The war story/horror film was called “As good – as scary fun – as early Spielberg” by Stephen King. 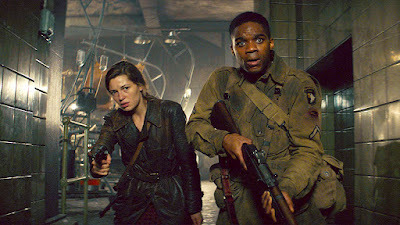 Overlord follows American paratroopers on the eve of D day with a crucial mission. 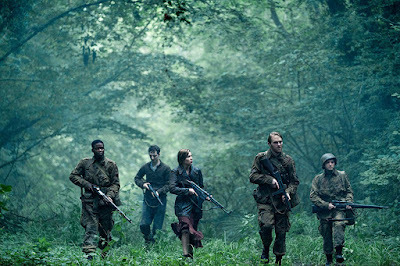 They will stumble across a Nazi experiment and face unexpected horrors. The night before D-Day, a handful of American paratroopers have survived the drop behind enemy lines. Their mission is to take down a communications tower which the German’s have installed atop a local church. The drop wasn’t easy and many of their fellow soldiers were killed on board or during the descent. 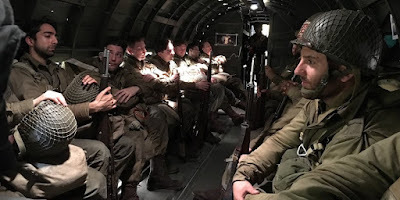 The small group of men remaining includes Private Boyce (Jovan Adepo) and Corporal Ford (Wyatt Russell). With just a handful of men, they must sneak into a Nazi occupied down and complete the mission. Disrupting German communication is key to the fate of the Allies. A local woman Chloe (Mathilde Ollivier) sticks her neck out to save the men and will assist them in infiltrating the church. One of the soldiers that I had an incredibly hard time placing is played by TV’s Agents of Shield’s Iain De Caestecker. That detail distracted me for far too long. The Germans have been searching houses and killing or kidnapping the townsfolk. Chloe’s parents are among those brutally murdered. Her aunt was taken to the church and has returned with severe physical deformities. Chloe is no friend to the Germans, but she goes above and beyond, while protecting her young brother at the same time. As the film begins it’s easy to wonder if it is a horror film or if it belongs solidly in the history category. The answer is, that it’s a horror film and the horror is coming. 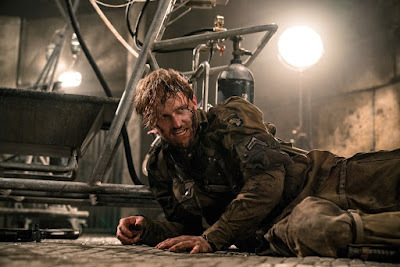 During the first half of the film the deaths are straight forward, and battle related. As the film continues, let’s just say it gets weird and gruesome. Overlord feels much like a video game. The soldiers are trying to infiltrate the church, hiding wherever they can with a solid mission to achieve. Half based in historical reality, half fantasy the film does mesh well, and it works. This is an example of a film with very few location changes that doesn’t get boring. The serious nature of the first half might have history buffs wanting to watch but if they can’t handle the gruesome horrors, they should skip this film all together. It was stranger than I expected. That’s not a bad thing for someone who values a unique horror film. 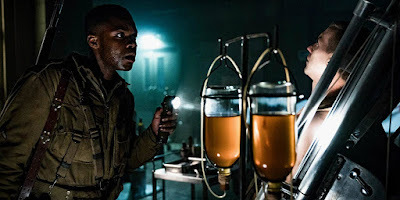 Paramount's UHD release of Overlord is a mild upgrade over the Blu-Ray. Sharpness and color saturation are improved. The film is very dark. The black levels hold up well in UHD with shadows and clarity in the darkest moments being very important. Even when watching UHD on your 4K TV, you’ll still want to watch at night in a dark room so that the sun and interior lighting don’t obscure the action. Seeing textures in the dark is critical to this film, and textural elements are easily perceived. 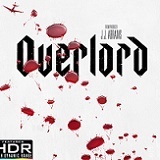 Overlord's Dolby Atmos soundtrack is stellar. The action makes use of all channels. Explosions ring true and are varied based on location. The gunfire is lifelike but also sounds authentic to the time period. The chaos of the paratrooper situation is felt and heard as explosions happen from all directions and ammunition breaks through metal planes and whizzes through the air. Dialogue is clear and is not overwhelmed by the action. Whispers do come in to play and are intelligible, as is yelling. Overlord's UHD disc contains no extras but the Blu-ray includes the supplemental features below. Creation (11:04): A discussion of the script and it’s underlying themes, casting, direction, production design and more. Death on the Ground (9:16): The action that takes place after the paratroopers land. Death Below (6:25): A look at the layered underworld with detail and backstory. Death No More (12:19): This featurette focuses on the creature design and special effects. Weapons and sets are discussed here as well. Brothers in Arms (5:03): Praise for Julius Avery's direction and J.J. Abrams' producing. Overlord feels like a feature length video game. Depending on the audience that may be a bonus or a draw back. The film draws you in as a straight forward film where a small group of paratroopers attempts to infiltrate a small town occupied by Nazis. The second half of the film is a supernatural thriller that is a downright creature feature. The film is rated R for strong bloody violence, disturbing images, language and brief sexual content. The images are certainly disturbing and not for the squeamish. Overlord’s audio is near perfect and the video surpassed expectations. With a short list of bonus features it presents well and is recommended to those with the stomach for sci-fi mutations.